Enter the Story is an ambitious project by Chris Tolworthy, where he intends to create playable versions of the world's most famous literary works. The individual games all connect with each other in the game's world, forming one large adventure game encompassing all of the novels that have been adapted. 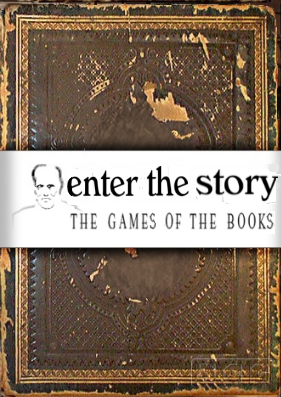 The Picture of Dorian Gray is free, and the rest of the games are free for half the story. The entire series (including the original five offline games can be purchased in a bundle pack). In this game of Victor Hugo's novel, Jean Valjean seeks redemption for his past in 19th century Paris. Travel through hell, purgatory, then finally paradise in the game of Dante Alighieri's famous poem. In this game based on The Theogony by Hesiod, witness the origin of the gods, the universe, and of humankind. In this game of Charles Dickens' novel, two groups of people struggle in Paris and London during the late 1700s. In this game of Alexandre Dumas' novel, wrongly imprisoned Dantes is given a chance for treasure and revenge. In this game of Oscar Wild's novel, Dorian Gray sells his soul so that a painting of him will age rather than he. In this game of Jules Verne's novel, a german scientist, his nephew, and a guide, travel to the center of the Earth. In this game of Jules Verne's novel, a businessman and a scientist discover that aliens inhabit the moon. In this game of William Shakespeare's play, the love of two young people is forbidden by their feuding families. In this game of William Shakespeare's play, a man commits treacherous acts to become and to keep his position as king. In this game of Mary Shelley's novel, a man uses cadavers to create a monster, who may not be a monster after all. In this game of William Shakespeare's play, lovers are fooled by fairies as Duke Theseus and Queen Hippolyta are wed. In this game of William Shakespeare's play, a Moor is to wed a senator's daughter, much to the Senator's disdain. In this game of William Shakespeare's play, Prince Hamlet seeks revenge upon his uncle for murdering his father. In this game of William Shakespeare's play, a king blinded by jealousy orders his servant to kill his childhood friend. In this game of William Shakespeare's play, a magician banished by his brother causes his brother's ship to wreck. In this game of William Shakespeare's play, rumors that Caesar plans to make Rome a monarchy lead to his death.